It’s Lovely Weather for a Stroll Through the Past. The Columbia/Legacy label set out to deliver a comprehensive review of jazz artists with their This Is Jazz series, allocating the tenth volume to Weather Report. Bookended by a trio of tracks from the band’s commercial breakthrough, Heavy Weather, this volume represents the recordings made in the Seventies. At nine tracks, it’s no more than a sampler, but it does attempt to draw out different facets of this ambitious, innovative outfit. Thus you hear a subdued ballad like “A Remark You Made” alongside the cool tones of a funk/jazz hybrid like “Black Market,” the soft “Orange Lady” leaning against the tempestuous “Teen Town.” At their most accessible, Weather Report made music that crossed over into melodic terrain, typified by the celebratory “Birdland.” But the band could be equally arty, as “The Moors” (which recalls early Roxy Music) and “Man In The Green Shirt” (a fair match for Frank Zappa’s jazz albums) attest to. The sound quality of the Columbia disc is excellent, although likely no better than the Columbia/Legacy reissues from the early ‘90s. The selection is fine, given the many choices they faced. Snubbing Sweetnighter was perhaps a necessary evil, though that album could have offered more than Mr. Gone’s “Young And Fine.” The liner notes from Tom Piazza are good and the documentation for the individual tracks thorough. At under one hour, Columbia could have opted to add more material, but what would it have accomplished? 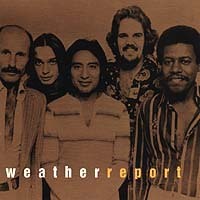 Given the renewed interest in jazz brought about by Ken Burns’ television series, this is a fine way to get your feet wet in Weather Report’s music. Wayne Shorter (soprano saxophone, tenor saxophone, lyricon), Joe Zawinul (piano, electric piano, synthesizer, melodica, vocal) with Alex Acuna (drums), Don Alias (percussion on 3), Manolo Badrena (tambourine, congas), Steve Gadd (drums on 5), Eric Gravatt (drums on 6), Skip Hadden (drums on 7), Alphonso Johnson (electric bass), Alyrio Lima (percussion on 4), Airto Moreira (percussion on 8), Alphonse Mouzon (drums on 8), Ndugu (Leon Chancler) (drums on 4), Jaco Pastorius (bass, vocal, drums), Ralph Towner (12-string guitar on 6), Dom Um Ramao (percussion), Miroslav Vitous (bass, electric bass), Narada Michael Walden (drums on 3), Ishmael Wilburn (drums on 7). Released on compact disc on April 30, 1996 in the US (Columbia Legacy, CK 64627).